Photo credit: Justin Hoch at Flickr Creative Commons. We’re only five days into April and President Trump is already kicking off Sexual Assault Awareness Month by defending Fox News host Bill O’Reilly. The news comes after a recent New York Times article revealed that O’Reilly and Fox News paid out $13 million to settle complaints from women who accused O’Reilly of inappropriate behavior. Coincidentally, Bill O’Reilly also doesn’t think he did anything wrong. Right after the scandal broke, O’Reilly hired crisis communication specialist Mark Fabiani to help craft a response statement. “Just like other prominent and controversial people, I’m vulnerable to lawsuits from individuals who want me to pay them to avoid negative publicity,” the statement from O’Reilly reads. 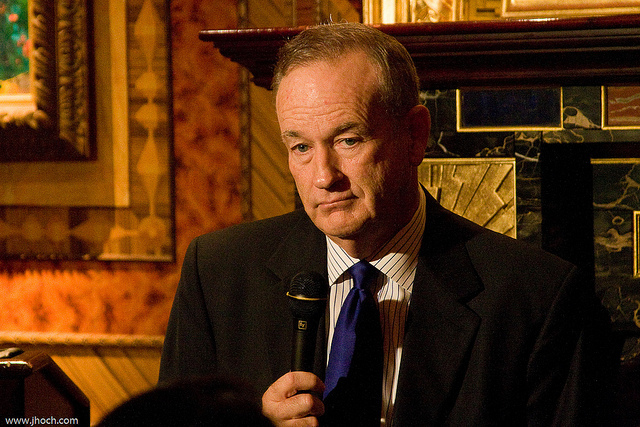 To date, a total of five women have accused O’Reilly of sexual harassment. But interestingly enough, one of them isn’t pursuing monetary compensation. Wendy Walsh, a former guest on O’Reilly’s nightly talk show, recalled an incident in which the political commentator tried to get her join him in his hotel suite. Shortly after turning him down, Walsh claimed that O’Reilly retaliated against her by dropping her from his segment. Regardless, it was inappropriate for the president of the United States to jump to O’Reilly’s defense. But considering that Trump has bragged about sexual assault in the past, unfortunately, this doesn’t come as a surprise.